When The Jimi Hendrix Experience arrived at the Atlanta International Pop Festival, they were greeted by a crowd estimated to be between 300,000-400,000. What is now remembered as the “last great rock festival” was an unlikely event for Jimi Hendrix to appear at. Byron, in Atlanta was in the heart of old the Deep South. This was Klan country. Racial tensions were always threatening to bubble over. The organisers of the 1970 Atlanta Pop Festival were well aware of this. So they made the conscious decision that the star of the show should be someone who appealed to everyone. This wasn’t going to be easy. So the organisers set about thinking of an artist or band who would appeal to both sides of the racial, cultural and socio political divide. This wasn’t going be easy. The organisers had to think how the audience would respond to certain artists, bands or situations. How would a rural audience in the Deep South feel about the so called long haired, hippie bands? Or how would they respond to black and white artists on the same bill? That could inflame an already volatile situation. While some promoters would’ve avoided this situation, the organisers of the Atlanta Pop Festival wanted to challenge the beliefs held by many of their potential audience. So, they booked a man who would unite the audience with the his music and his message of universal love, Jimi Hendrix. It wasn’t just Jimi Hendrix that would star at the second Atlanta Pop Festival. No. 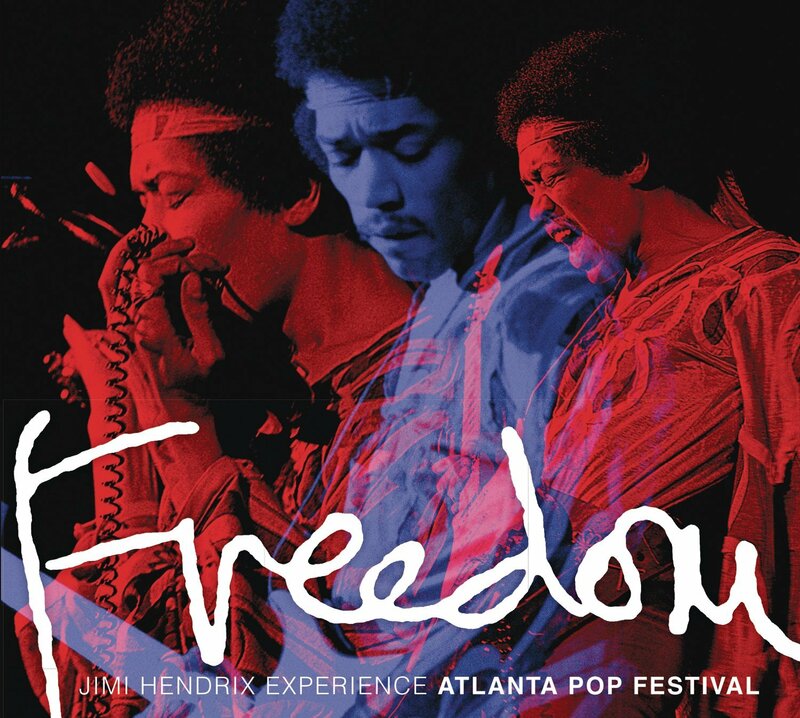 On 4th of July 1970, the Jimi Hendrix Experience had reformed, and this alternate lineup of the Experience would take to the stage and work their way through sixteen songs that feature on Freedom-Atlanta Pop Festival, which was recently released by Sony Music. It’s a musical masterclass from a musical legend. Accompanied by bassist Billy Cox and drummer Mitch Mitchell, Jimi Hendrix showman extraordinaire and guitar virtuoso had the huge audience spellbound as he worked his way through classics like Foxy Lady, Hey Joe and Purple Haze, plus a cover version of Bob Dylan’s All Along The Watchtower. Jimi even showcased songs from his next album, which was going to feature Room Full Of Mirrors, Freedom, Hear My Train A-Comin’ and Hey Baby (New Rising Sun) were heard by many for the first time. Then as fireworks exploded, Jimi launched into a rendition of The Star Spangled Banner. He wasn’t finished yet, and returned for an encore of Straight Ahead. When he left the stage that night, nobody realised that the second Atlanta Pop Festival would be the last major American concert Jimi Hendrix would play at. Ten weeks later on 18th September 1970, Jimi Hendrix was pronounced dead. He was just twenty-seven. For Jimi Hendrix the last three years had been a whirlwind. He took music by storm when The Jimi Hendrix released their debut album Are You Experienced? in 1967. Music was never the same after the release of Are You Experienced? When The Jimi Hendrix Experience took to the stage at the Atlanta International Pop Festival, they were greeted by a crowd estimated to be between 300,000-400,000. The Jimi Hendrix Experience launched into what was a blistering set. A Jimi took to the stage, he’s greeted by an audience that’s united. As he tunes his guitar, he introduces the band. Only then does he launch into a blistering version of Fire, before moving on to Lover Man and Spanish Castle Magic. Red House sees a stylistic change, as Jimi pays homage to his bluesy roots. Not only does he unleash a spellbinding solo, but a testifying vocal. From there, Jimi showcased three new song. The first of was Room Full of Mirrors, which The Jimi Hendrix Experience followup with Room Full Of Mirrors and Hear My Train A-Comin.’ It’s poignant listening to this trio of tracks, knowing that Jimi would be dead by the time these songs were released. After a trio of new songs, The Jimi Hendrix Experience kicks loose on Message to Love. Fittingly, Jimi’s guitar plays a starring role, while as the rhythm section of bassist Billy Cox and drummer Mitch Mitchell seem content to play a supporting role. It’s a fitting way to close disc one. Disc two opens with All Along the Watchtower. The Jimi Hendrix Experience are given an enthusiastic response as they launch into a classic track. It’s the first of several classics. Before that, Freedom, The Jimi Hendrix Experience showcase another new songs Freedom. This is fitting. Jimi had gone into a region divided, and was preaching a message of universal love and now Freedom. Given the South’s history, it’s a poignant song. The way Jimi delivers the lyrics, it’s as if he’s making a point. Having done so, it’s nearly classic all the way. That’s despite Jimi’s solo career beginning just four years earlier. Since then, Jimi had released a trio of studio album and one live album. However, since Jimi’s death, numerous posthumous albums have been released. This includes Freedom: Atlanta Pop Festival, which was recently released by Sony Music. Freedom: Atlanta Pop Festival, is a reminder of a musical maverick at the peak of his powers. It was T-Bone who Jimi saw playing his guitar with his teeth. When Jimi saw this, he took it as a challenge. This became part of Jimi’s routine. In years to come, Jimi played his guitar as if his life depended upon it. Jimi, on form, was like a man possessed. Some nights, Jimi played his guitar behind his back, played it with his teeth and as if trying to exercise some inner demons, set his guitar on fire. All this made Jimi one of the most exiting guitarists ever. However, Jimi was also a technically brilliant guitarists of his generation. That’s apparent on Freedom: Atlanta Pop Festival, which features a flamboyant, musical maverick at the peak of his powers. Along with the rest of The Jimi Hendrix Experience he combines classics, cover versions and new songs on Freedom: Atlanta Pop Festival, and in the process, united a region that previously, had been divided.